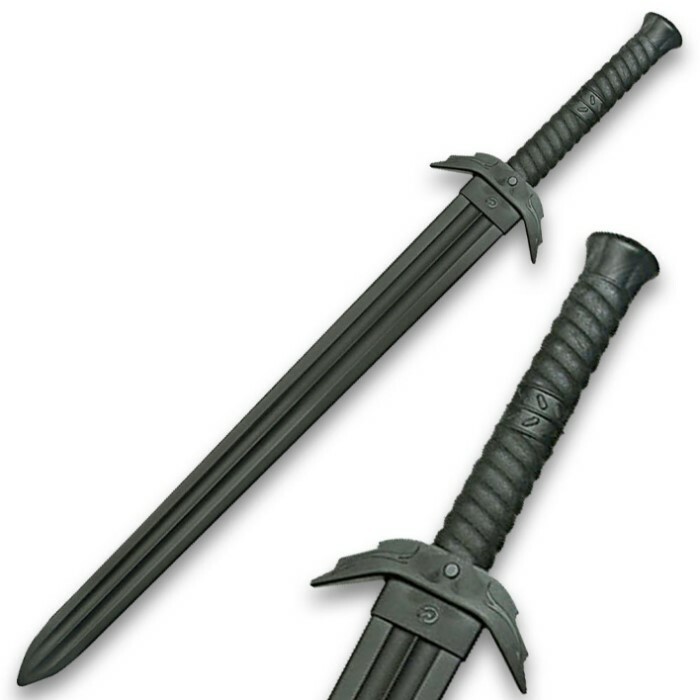 Polypropylene Training Roman Sword | BUDK.com - Knives & Swords At The Lowest Prices! Learn to fight like a Roman gladiator with this polypropylene training sword. This Roman training sword is made of polypropylene, so you can wield it safely and learn what you're doing without breaking the bank. Very strong, holds up well. My brother and I spar with them and they do well. Be careful, as it can break bones. Good weight, easy to wield, fits in my hand very nicely. Can be used two or one handed. I would recommend to anyone looking for a practice sword. I love this sword it looks good fun it use and it is very tough. My only complaint is that it has a short blade and a long handle which is not historically accurate and makes it not as agile and powerful. But that is ok because it is obviously fantasyI would definitely recommend it! This is the second of these I have purchased and again I am not disappointed. It came within 48 hours of me ordering, and was in perfect condition. No wattage, no scratches, nearly packaged and ready to use. These are some tough training swords and I've yet to see one broken. Definitely worth the buy! Bought this about 2 or 3 years ago from writing this. Absolutely love it. Still pull it out and practice occasionally. It is dangerous though. Almost broke my sparring partners finger with it! Not a Cold steel trainer, but I like it. It works pretty well. I hit some bigger ( 3"- 6") trees and It did not show any abuse. It handles like the cold steel gladius trainer. It just looks a little different. My first purchase from TrueSwords - and a good one. Delivered within a week on the cheapest shipping and in good condition. Overall, the sword is very well made. The blade came a bit bent, but with a little work it shouldn't be hard to fix, and it by no means makes the sword unusable. The material is very durable; it stood up to a very intense training session without even a dent. The measurements are exactly as I expected (although I had to calculate them myself due to a badly written description), and the blade is nearly the perfect weight for it's size. Visually, the sword is a beauty. The designs are subtle but interesting, and the handle is fairly ergonomic to use. There are also 3 Japanese characters on each side of the blade; while they are hard to read as they're fairly over-stylized, they appear to say "kami no ken", meaning "sword of god". A very interesting choice. My only real complaint is that the blade's balance is a bit off - it sits about 2-3 inches above the guard. However, with a little compensation in your fighting style, this isn't too hard to counteract. Pros: sturdy construction, good weight, all one piece. Cons: not a "Roman" sword, despite the headline. Far too long, wrong style hilt and pommel, balance is completely different from a gladius. Also, compared to the Cold Steel training weapons, these HURT. Edges are flat instead of rounded. Catching someone anywhere but pads is going to leave a nasty bruise. I bought this sword with little expectations. I was wrong. This practice sword holds up very well and has a great weight to it. There are marks on the blade, towards to hilt that look Japanese, but it doesn't detract from the overall feel. This sword is great and will hold up very well to any practice needs. Great item! This was actually my first purchase from True-swords, and it arrived on time in great condition, I haven't had a chance to actually test it out yet, but the material seems firm and the patterns on the "blade" are rather neat. One downside, it seemed a bit short.